As much as a visit to Voodoo Doughnuts is a default thing to do when one is in Portland, there is actually better found elsewhere. 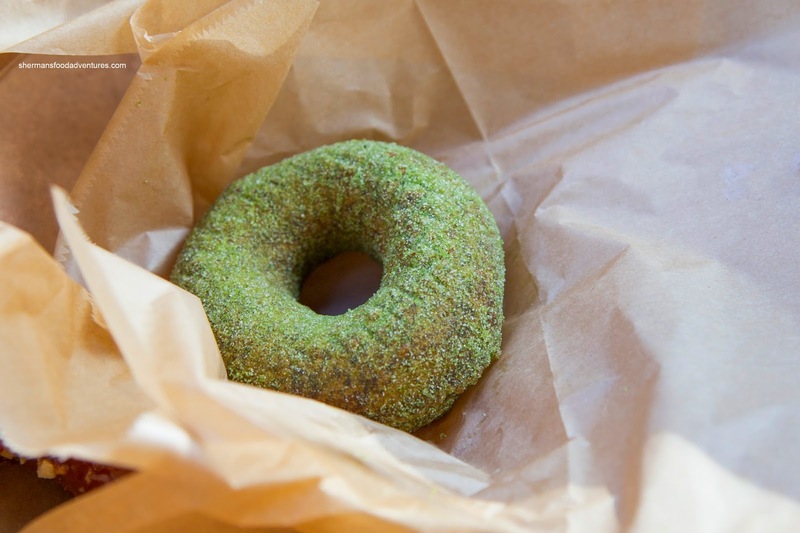 Imagine donuts that are less about novelty and more about quality. Then consider that they are made with brioche and have elevated flavors. 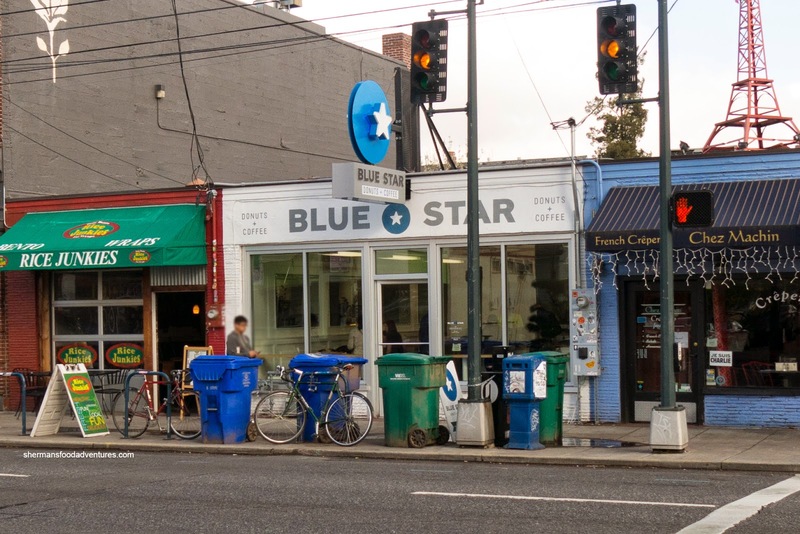 Yes, they do cost more and while Voodoo represents the everyday donut, Blue Star goes for more of the high end trendy crowd. That was never more evident in the pricing as I could only get a dozen where I got a dozen and a half at Voodoo. 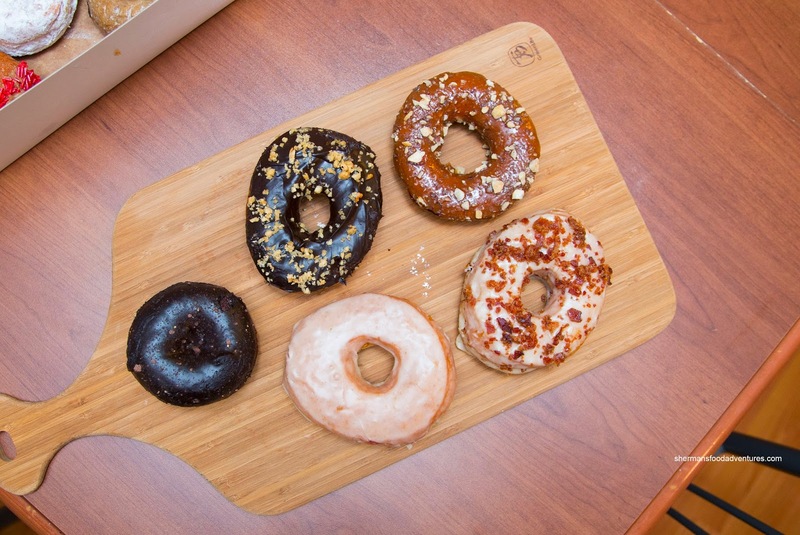 With flavors such as Mexican Chocolate, Chocolate Almond Ganache, Dulce de Leche with hazelnuts, Real Maple Bacon and Original Glazed (clockwise from the left), it was pretty apparent that these donuts meant business. Texturally, the donuts were moist and soft while not appearing to be overly greasy. In terms of sweetness, it really depended which one we ate. For instance, the Mexican chocolate was a bit spicy and bitter but hardly sweet. As much as the dulce de leche was bound to be sugary, they didn't go overboard. However, the maple bacon did register quite high on the sugar meter. Overall, the donut itself (ignoring the glaze and toppings) was not sweet at all, which meant there wasn't an overload of sugar. On that note, we found the Matcha Green Tea to be mildly sweet where the bitter notes of the green tea really came through. Being a cake donut, the texture was more dense, but still moist and of course not very sweet. 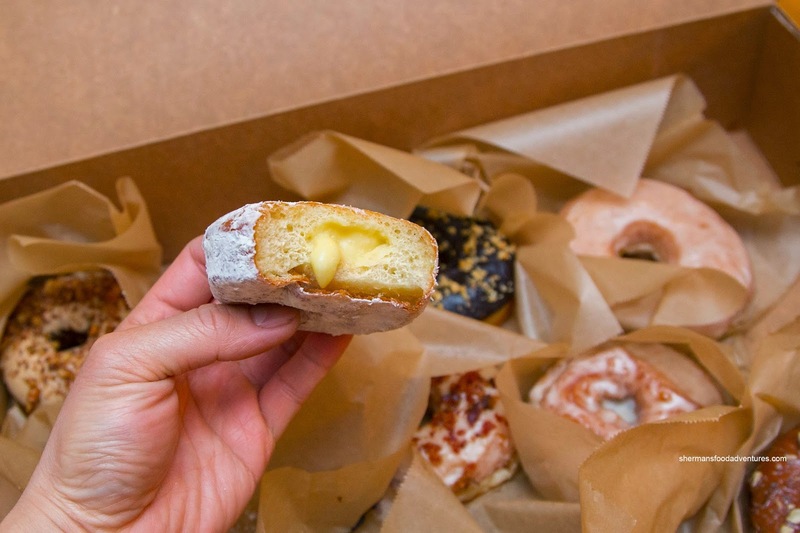 Personally, I love anything that has lemon in it and naturally, I really enjoyed the Meyer Lemon & Key Lime Curd donut. Soft, fluffy and light, this was well-balanced with a dusting of confectioners sugar and filled with a semi sweet tart curd. I thought the ratio of donut-to-filling was spot on while the consistency of the curd was just right where it was not runny nor clumpy. 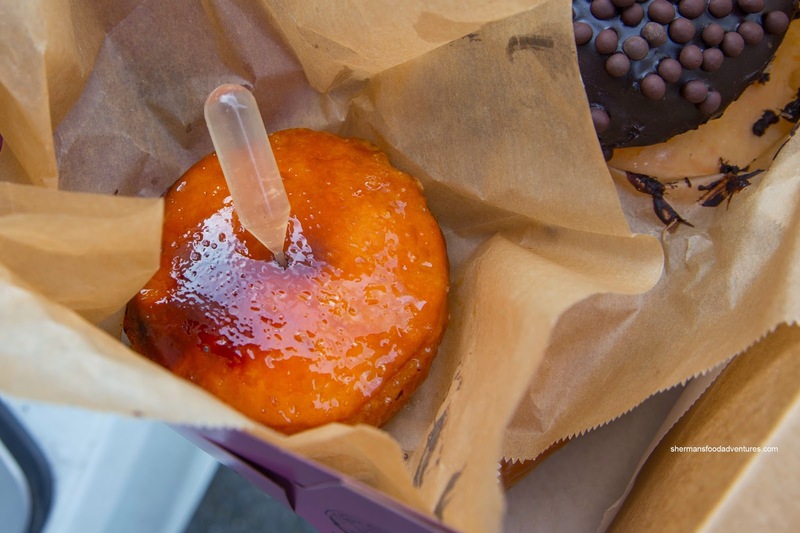 We can't forget their signature item being the Cointreau Crème Brûlée featuring a house-made vanilla custard hidden within the soft brioche donut. With a torched sugary top, the sweet crunch was accented by a pipette of Cointreau syrup. Yes, this was sweet, but definitely different and a nice collection of textures. 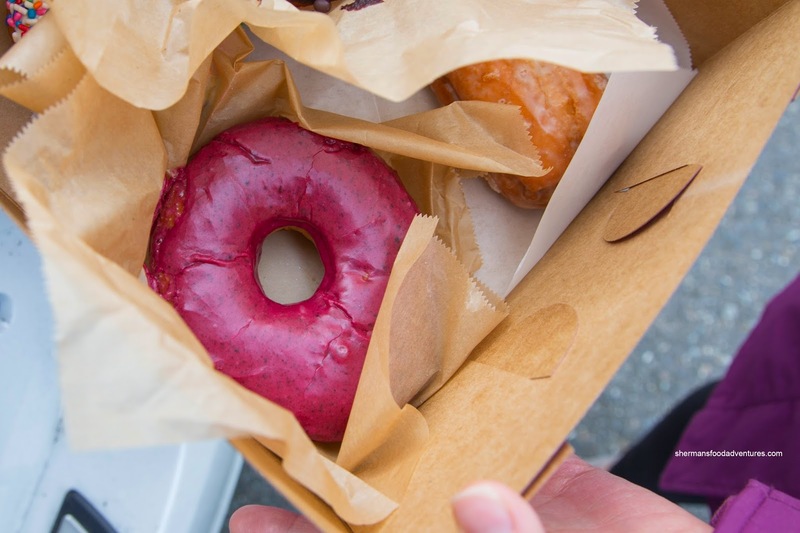 Ending off with the Blueberry Bourbon Basil, we found a donut that was aggressively glazed, but not sickeningly sweet. Nice mild blueberry notes complimented by only a touch of bourbon and the herbaceous basil notes. As you can clearly see, the donuts at Blue Star are gourmet in terms of ingredients and execution. Sure, they're expensive, but for me, they are worthy every penny.